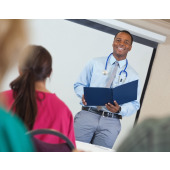 There are several paths to becoming a nurse educator. Two common paths include a master of science in nursing (MSN) with a nurse educator specialty and an MSN with a nurse educator certificate. Note that some nurse educators hold a DNP or PhD, which is often a requirement at prestigious colleges and universities. Because nurse education is a popular field, most nursing schools offer a variety of accredited programs leading to a degree or certificate. Some even offer online programs that offer the flexibility to complete coursework and assignments on you own time. Some top accredited options for an online nurse educator certificate include University of Phoenix, West Coast University, and South University. Besides opportunities to work in a variety of environments, nurse educators have good earning potential. The mean annual wage for nurse educators was $75,030 in 2016. Those working at specialty hospitals psychiatric and substance abuse hospitals, and general medical and surgical hospitals earned $106,910, $88,630, and $86,980, respectively. Nurse educators do well at colleges, universities, and professional schools, where they average $76,480. However, at $82,490 salaries are higher at technical and trade schools. If you are an RN looking to advance your career, consider nurse education and start earning more. We’ve compiled below a list of accredited nursing schools with an online nurse educator certificate to help you get started.